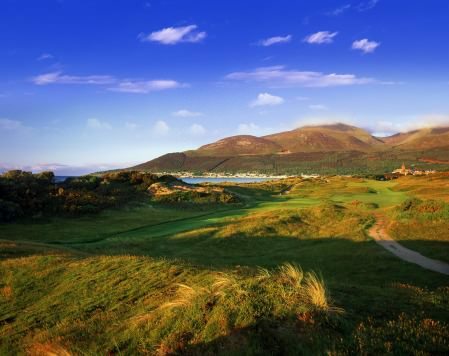 Royal County Down has been voted as Ireland’s No 1 course for 2012 by Golf Digest Ireland. The complaining can officially begin - Golf Digest Ireland has released the Volvo-sponsored “Top-100 Ranked Irish Golf Courses for 2012” and not all will be pleased. The top-3 remains the same with Royal County Down voted the top course in Ireland ahead of Portmarnock and Royal Portrush. However, Waterville has jumped two spots to fourth ahead of Ballybunion’s Old Course with Lahinch up one to sixth and Tralee up three places from 10th to seventh. The big “losers”, if that is the correct term, were The European Club, which slipped four places to eighth, and Adare, which is down two spots to 10th ahead of County Louth, which remained in ninth place. Those who believe that their clubs have been unfairly ranked can now include readers of Golf Digest Ireland on their hit-lists as “rank-and-file golfers” contributed to drawing up the list this year. “With a view to making the ranking extra special, we considered it appropriate to enlist the views of what could be described as ordinary, day-to-day golfers,” said Linton Walton, editor of Golf Digest Ireland. First launched eight years ago, Golf Digest Ireland’s official Irish golf course ranking has become a popular marketing tool for Irish clubs and an unofficial barometer of the health of the industry. And in a change from the 2010 list - the 2011 ranking appears to have vanished into the ether - clubs which are in receivership or administration were included this time, having been excluded from the list issued in November last year. The thorough nature of the exercise can be gleaned from the fact that at the beginning of each year, Golf Digest Ireland writes to every club in Ireland with an 18-hole course and asks if any upgrade work has been undertaken over the previous 12 months. In this context, no fewer than 83 golf clubs wrote back this year, outlining details of various projects they had addressed. Where appropriate, these clubs were then added to last year’s Top-100. Also added were the leading 20 golf clubs which did not make last year’s rankings along with all those clubs which are currently in receivership or administration. From this comprehensive list, the final ranking was made. Padraig O’hUiginn, the former Chairman of Failte Ireland, has continued in the role as chairman. For the latest rankings, he has been joined by Eddie Connaughton (Agronomist), Kate McCann (Former Irish international), Mark Gannon (R&A Selector), Valerie Hassett (Munster Interprovincial), Ally McIntosh (GDI course design columnist) and Cecil Whelan (founder of the Links Golfing Society). The panel also featured: John Kelly (PGA professional and former PGA Order of Merit winner), Dougie Heather (Former chairman of International Sports Management and former Irish International golfer), Linton Walsh (Editor of Golf Digest Ireland), Kevin Whitson (PGA Professional) and Mark MaGowan (PGA professional). The further addition of a representative of the Golf Digest readers’ panel completed the list. Apart from “new entries” such as Fota Island’s Deerpark course (40th), The Old Head of Kinsale makes the biggest leap, rising 23 places from 47th to 24th. Castletroy leaps 22 places to 63rd while Doonbeg is up 13 to 23rd and Ballyliffin’s Old Links up 10 to 22nd. While Adare Manor has slipped two places to 10th in the overall list, it retains its position as the country’s leading parkland stretch ahead of Mount Juliet, Killeen Castle and the Palmer Course at The K Club.